Sometimes great relationships start by accident; you know, the kind of serendipitous encounters that end up with partners exchanging flowers (roses of course)! For the past few years Weeks Roses and Cal Poly Pomona have enjoyed a growing relationship, literally. As Weeks Roses was looking to move their research facility from their Upland, California home time suddenly became an issue. They were forced to look for a suitable location while not interrupting the research team’s work on hybridizing new varieties. 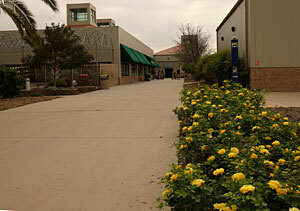 Through a chain of events Tom Carruth, Weeks Roses’ Research Director, was put in contact with Cal Poly Pomona. This school, tucked along a hillside on the western region of the Inland Empire, has long been known for their horticulture programs. After some discussions, agreements and additions the facility was ready for Carruth and his team to move their research facility only a few miles down the road. 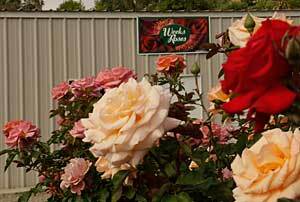 Weeks Roses made donations to help improve and expand the infrastructure of the horticulture department. 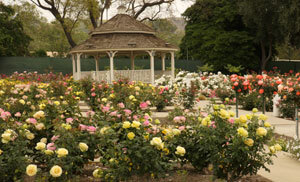 With new and expanded greenhouses and several areas to test roses the Weeks / Cal Poly relationship began to flourish. In a few short years the benefits are already evident. Carruth explains that by working together the two partners are able to share information such as fertilization and hybridization technologies. 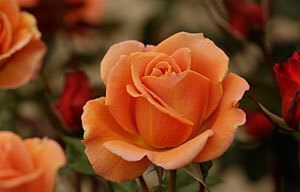 Students experience first hand how a leader in the rose industry works to produce award winning roses. Carruth expects students to become even more involved with graduate projects. Entire classes experience concepts they previously were exposed to only in a classroom. Now they benefit by actually seeing how a concept is applied in the real world, even helping with the tasks. Students learn techniques on everything from potting to pruning, hybridizing to planting seeds in this real world classroom. Carruth even see the possibility of employment opportunities in the future. 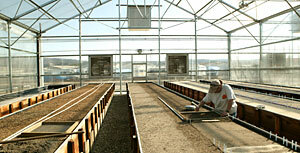 The school has received other benefits as well including hundreds of plants donated around the facility. These include a mass planting of Cinco de Mayo around the farm store and refurbishing the historic Kellogg Garden in the middle of campus. 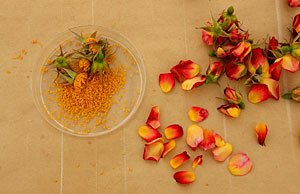 For the historic garden many roses were replaced with the same varieties. New roses were added keeping with the original color scheme of this historic planting. Also underway is the establishment of a test garden for All America Rose Selections evaluations, one of 24 in the nation. While visitors are shopping for fresh produce at the school’s farm store they will be able to view varieties of roses while they are in the process of a two year trial, attempting to become an AARS selection. Only a few roses are chosen for this prestigious recognition each year. One feature somewhat unique to the region is that its micro climate tends to cause more disease pressure on roses. Where gardeners will find this as a major disadvantage Carruth looks at this as a benefit for his research. By working with roses in a disease-prone area he is able to weed out new plantings that easily succumb to ailments. This in turn is a great advantage to gardeners around the country. Carruth and the Weeks Roses research team enjoy their new facility, benefiting from larger greenhouses, better climate control technology and a symbiotic relationship with the horticulture department at the university. He also mentions another advantage of the new location, their proximity to the fresh produce at the Cal Poly Farm Store. They even get to smell the roses while shopping.